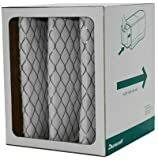 Electrostatic replacement air filter fits Searsreg; Kenmore models 160, 831320, 83232, and 83233. This filter is the aftermarket replacement filter which measures approximately 6 3/8 x 7 1/4 x 8. For optimum performance, replace filter every 2 to 3 months. This is an aftermarket filter. Tranereg; Aftermarket Replacement Filter. Approximately 27(L) 1 filters per case MERV 13 High efficiency filter media collects small dust particles before they can collect on your coils. For retrofit kit model numbers that begin with BAYFTFR. These filters are designed to work with the Tranereg; Retrofit Frame Kit. You must already have the Retrofit Frame Kit for these filters to work in your unit. Also known as: BAYFTFREXM / BAYFTFREXM2A Replace every 6 months. This is an aftermarket filter. Can be used to replace washable pre-filter #BAYFTAH26W1A.